Two Bears Farm and the Three Cubs: Where Do You Find Your Farm Machinery? Where Do You Find Your Farm Machinery? This is a sponsored post for Trade Farm Machinery. I have not purchased anything from their site, but the opinions below are my own, and are written by me. I think all of our farm machinery is used. Being on such a tight budget, it has been our only option. Our tractor and all of the accompanying equipment is in various stages of weathering - most of it dates from the 1950s - 1970s. So where do you find used tractors for sale? Well, if you are in Australia, you could try checking out TradeFarmMachinery.com.au. It's a website devoted to finding used (and new) farm machinery, and has a wide variety of products available. You can save your searches and even compare pricing through their website. 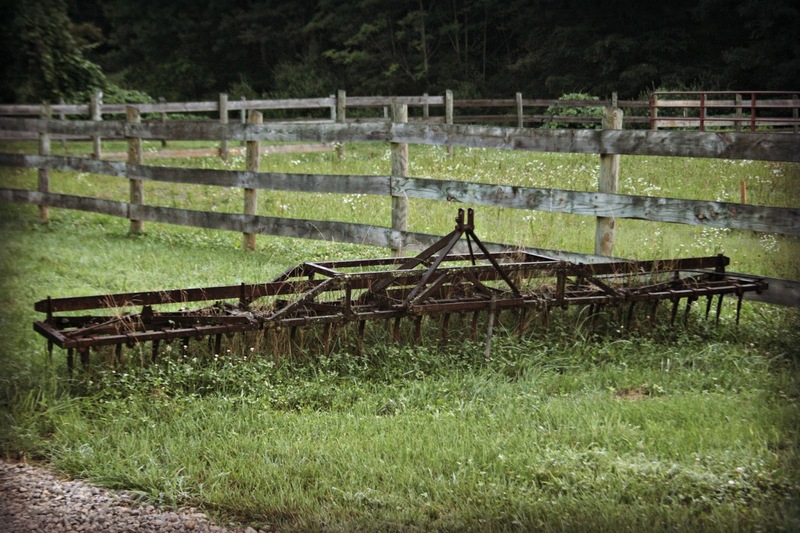 Readers, you might be tired of seeing pictures of our old blue tractor, so here's one of our old rusted weeder. Every year, when hay season rolls around, something inevitably breaks and we need to find replacement parts or (in the unfortunate occasion of last summer) buy a used replacement piece. Having a go-to website where you could find what you need would save so much time! Readers, are things always breaking down around your place too? That is a neat site, I like the way that you can search in so many ways. I like the really old tractors and I found several quickly by just putting a date range in. There was a 1950 Fordson that was a brute. I love the look of your old weed thingy:) but I know what you mean. There always seems something that needs fixed. Right now it is our Hay Wagon and the barn needs painted badly! Mike usually finds things via Craigslist or word of mouth. I never heard of a weeder before, but this sure looks dangerous! Funny you posted this now, we just returned from a tractor parade! YES! My 1958 641 Ford tractor has decided it did't want to start one day last week. I'm afraid I'm going to have to break down an order some parts this time :(. Farming Equipment is so expensive! Our neighbor has several pieces of machinery and they are all quite old too. He says it's much cheaper to replace parts than buy new! Since we no longer live on a farm, we don't need equipment.TradeFarmMachinery.com.au. has the right idea for searching and finding farm equipment. I am sorry that your machines are breaking down. Looks like a good resource Lisa. I enjoy the artistic value that farm equipment has--folks around here enjoy creating that rustic look in their yards as well. We have the local small town stores where men gather and chat. So, all you have to do is go there and mention what you are looking for. Seriously! I like looking at old farm equipment. Saw a lot of it this weekend at the county fair. Seems like there's always something wrong with one of our older mowers. I like the farm equipment photos. I don't get tired of seeing them - as I'm not on a farm, I guess (and haven't been riding lately, so I don't get a chance to see stuff like that regularly anymore). Oh my- from the tractor to the bush hog- if it isn't one thing, it's another!